Standard Manicure £19.50 - treating your nails, cuticles, hand massage and varnish. Luxury Manicure £25.50 - including heated mitts to nourish dry hand and help stiff joints. Le Remedie £19.50 - an anti-ageing treatment for your hands to reduce dry crepey skin by hydrating and firming, while treating age spots, transforming your hands. Le Remedie Manicure £29.50 - including a full manicure and polish. Gel Shape and Polish £30.00 - nails are filed and finished with geleration polish. Gel Manicure £35.00 - Incl. exfoliation, massage, cuticles, file & geleration polish. 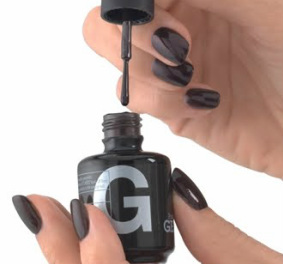 Gel Refresh £25.00 - nails shaped and your existing polish applied. Gel Pedicure £40.00 - a full pedicure with geleration polish. Nail treatments for under 12's, including nail art and diamantes! Available in all colours & shades from black through to gold, including fine giltter, discs, & strips. So add some sparkle to your fingers and toes. Available in many colours and designs, from flowers and hearts to butterflies and bows, so you can get create. Add sparkle to your nails with crystals, metallic studs and pearls. Arrange them in lines, random or flowers. Put some extra bling into the party season this year with our Crystal nails which are fully encrusted in crystals, with a choice of clear, red, pink and purple.